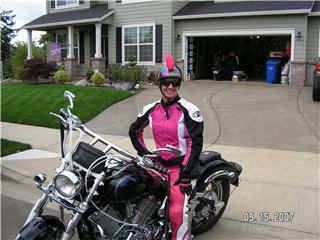 I ride a 2003 Yamaha Vstar 1100 Custom. The very first thing I did was lower it so I sat on it more comfortably. Next was to add chrome, more chrome and more chrome. I didn't like the look of the stock handle bars so I replaced them with drag bars. I love my bike and wouldn't trade her for anything! Awesome bike! I just bought a 2010 V Star 950. I'm always looking for friendly riders, I live in the Portland, OR area. Do you know what kind of bike clubs are around? A Yamaha (V Star) club maybe? Lovin' the bike and lovin' the attitude!! Ride on!! I ride a Honda VTX 1300...please warm weather hurry! What is on the top of your helmet? Love the bike and the motorcycle gear. Hmmm....your own site now!!! What's next little sister? My 2002 VStar 1100 has the same gray & blue pinstripes. I just bought it in November and LOVE riding it. I love your riding suit. They sure can't say they didn't see you coming! Ride on girl! You are the type of person that makes life interesting! Ride on?